What to Wear on the Mountain for a Ski Trip ~ Roses and Rain Boots . 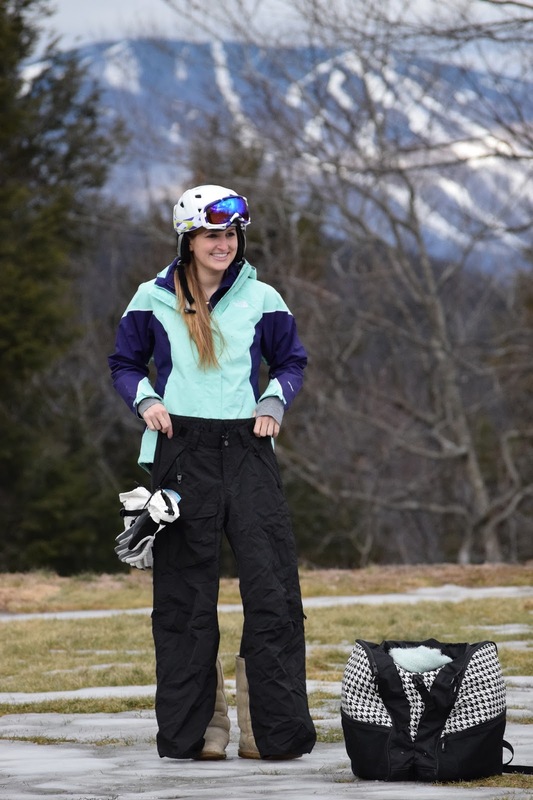 Today's post is all about what I wore this past weekend at Okemo. In addition to demonstrating how following my 5 essential tips for skiers (and snowboarders) has me maximizing my skiing experience. For starters, that is Okemo in the background. The castle (more about that coming this week-stay tuned) has a breath taking view of the mountain. Now for the attire, I always wear a wick away long sleeve Under Armour and a long sleeve gym shirt over it because believe it or not you always end up getting a little sweaty from skiing, you are exercising! I prefer a shirt with thumb holes so I can easily keep my sleeves pulled down while wearing gloves. This really helps to prevent any exposed skin, especially your wrists, while on the slopes. I also wear my jacket's faux fur liner on the way to the mountain. I did not include my backpack in one of my essentials and now regret it. So please consider this tip number 6. Get a backpack that will hold all your ski gear in it. This frees your hands up to carry your Ski's and poles easily. I always wear two additional layers (long-johns and yoga pants) because I hate to be cold! I understand that disliking the cold while skiing is kind of an oxymoron but it's so true. Being too cold can ruin your ski experience. See last Friday's post to learn more about why I don't wear my ski pants to the mountain. I keep my gloves hooked to my pants so that way I can keep them all together because I usually need my hands free (without gloves) to get everything ready, zipped etc. and having them attached keeps me from leaving them behind in the lodge accidentally. Lastly, Remember to always wear your helmet! Still a non-negotiable. Thanks for joining me today at Roses and Rain Boots. I hope y'all had a wonderful weekend and great Monday, back to the workday grind. Be sure to check out my instagram to take a peak at me on the ski mountain. Skiing this weekend! Nice info! I enjoy snowshoeing. Your suggestions will definitely come in handy!